Just wanted to pop in this morning for a quick hello. A few weeks ago I showed this stack of fabric that I've had pulled for 18 months or so. Sometimes I post things like that in hopes that it motivates me to work on said project. Here's where I'm at with it. I'm doing a small #scrappytripalong. While I'm not normally a band wagon jumper, I just needed to be done with this project. The scrappy trip block seemed the perfect speedy block to help me end the misery of my poor fabrics. On a side note, don't forget you can still enter to win a copy of the Quiltmaker's 100 Blocks magazine. It's a great resource for new block ideas. Since my blog is new and my readership is still small the odds are in your favor! You have until Monday. Lastly, my mom reads my blog (Hi Mom!!) 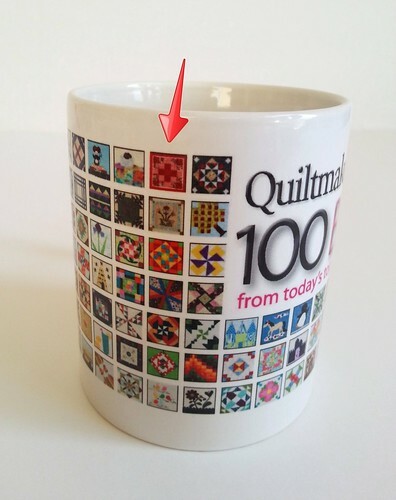 so I wanted to show off the nifty coffee mug I received from Quiltmaker for being part of #100blocks. Cute, huh? Your mug (and block!) are great - what a great treat. I'm visiting from Crazy Mom Quilts' Finish it up Friday party. Great job and congrats on the magazine block! Your blocks are so beautiful, I love the colors! And congrats on the quilt block. I think your scrappy trip blocks are fun! and I know how it feels to just be moving forward in something even if it isn't as smashing as we hoped. good job! i love the colors of your quilt - so feminie! and a scappytripalong has been on the "to do" list for quite some time!! love the mug- how cool! Hi. Your scrappy tripalong is looking great. Love your colors. I hope you enjoy sipping out of your wonderful mug. By Friday everyone at my house is tired and grumpy. Hooray for weekends! I think that is the prettiest trip along I've seen. I love your soft color choices. Love your scrappy trip. I think I'm going to have to try one of those one day. Thanks for the drawing. I'm dying to do a scrappy trip. I adore these colors. Well Done! I am making the same size quilt as you...and I, also, NEED to move on...love your colors! I have scraps I need to use, and this quilt would be good to try it out. Not sure I want to make a big quilt. But, I think my scraps would be utilized in a good way. Thanks for the offer with giveaway. Emily I think your scrappy trip-along looks great. 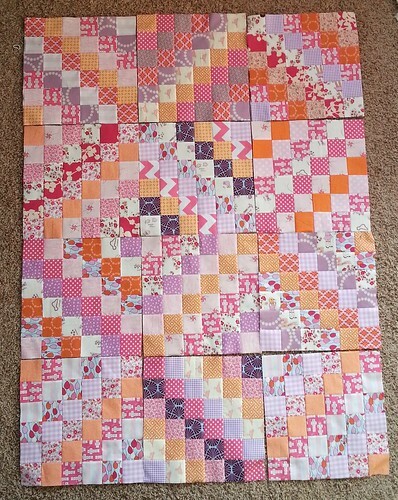 I really like the pink/orange/purple combination :o) I want to make one of these quilts to use up some fabric I bought way back when I started quilting. I'm trying really hard to make myself hold off on starting it until I finish up four others that kind of have deadlines. I love the colors in your scrappy trip quilt. Love the mug too!